A wonderful way to learn more about alpaca and a terrific farm experience for people of all ages. Every participant will learn the basics of alpaca care, as well as where alpaca come from and why they are important to us. Participants go behind the scenes and get involved in hands-on activities such as barn chores, feeding, halter training, and, if luck should have it, witness the birth of a new herd member. (Birthing season is from May to September). Participants will meet the entire herd, including our three cria (baby alpaca) from last summer. 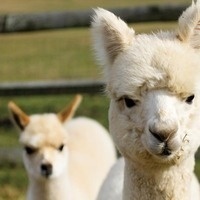 This is an opportunity to see and experience the alpaca in a way they would not have by just visiting the farm. One can see how sweet and gentle they are by interacting with them, and literally get your hands on them to see how luxurious, and soft their fleece is. Alpaca Discovery is a fun farm experience for any alpaca lover age 14 or older; (younger participants welcomed with attending parent/guardian.) One child under the age of 14 per attending parent/guardian). Alpaca Discovery is also perfect for adults who are thinking about owning alpaca, or just curious to learn more about them.